21 million light-years away M101 is a relatively large galaxy compared to the Milky Way. With a diameter of 170,000 light-years it is seventy percent larger than the Milky Way. It has a disk mass on the order of 100 billion solar masses, along with a small bulge of about 3 billion solar masses. Another remarkable property of this galaxy is its huge and extremely bright H II regions, of which a total of about 3,000 can be seen on photographs. (Maybe not so many on my shot here - but note the red/pink that the Ha (Hydrogen alpha) filter has brought out ). H II regions usually accompany the enormous clouds of high density molecular hydrogen gas contracting under their own gravitational force where stars form. H II regions are ionized by large numbers of extremely bright and hot young stars. M101 can be seen to be asymmetrical on one side. 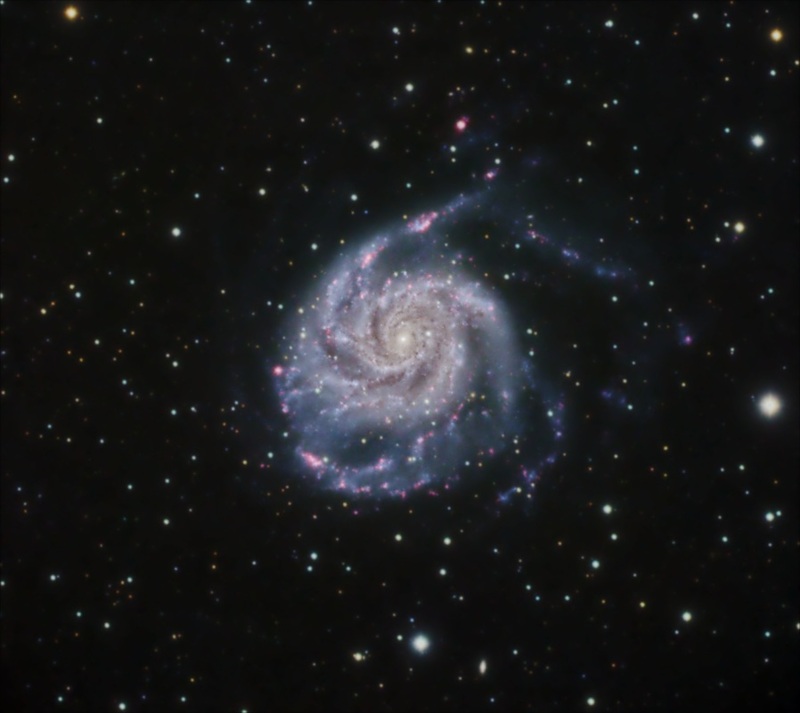 It is thought that in the recent past (speaking in galactic terms) M101 underwent a near collision with another galaxy and the associated gravitational tidal forces caused the asymmetry. In addition, this encounter also amplified the density waves in the spiral arms of M101. The amplification of these waves leads to the compression of the interstellar hydrogen gas, which then triggers strong star formation activity.